What fiber are you dyeing? Are you dyeing cotton? If so, you are dyeing cellulose. Cellulose is the main structural molecule found in plants. Are you dyeing an animal fiber, such as silk or wool? All animal fibers are made of protein. Silk can also be dyed with the same dyes and recipes used for cellulose. Are you dyeing a synthetic fiber? Nylon can be dyed like protein fibers, but other synthetics can be dyed only with special dyes that are unsuitable for use on plant or animal fibers. Use for tie-dye, vat dyeing, batik, airbrush, hand painting, printing, spatter-painting, and more. Will not dye synthetics. Your choice of dye depends directly on what kind of fabric you are using. You'll get bad results if you use a wool dye on cotton, or a cotton dye recipe on wool, or either on polyester. These are your choices if you want to dye a t-shirt. Cellulose fibers include cotton, linen, rayon, hemp, ramie, lyocell (Tencel), bamboo, and pineapple plant fiber. Protein fibers include all fibers made by animals: wool, angora, mohair, cashmere, as well as silk. Silk is the only non-hair animal fiber, and can be dyed like wool or like cellulose fibers, above. The high-pH recipes used for most cellulose dyes will ruin animal hair fibers. Also see Dyes for Protein Fibers. 'Soy Silk' is a new plant fiber, but, because it is made from soybean protein, it should be dyed like animal fibers, instead. Like real silk, it can also be dyed with fiber reactive dyes. Polyester requires the use of disperse dyes. 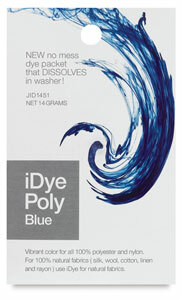 See Disperse Dye for Polyester. Surprisingly, nylon, which is a truly synthetic fiber, happens to dye quite well with the same acid dyes that work on wool and other animal fibers, in addition to dyes that work on polyester. Acid dyes are more washfast on nylon than disperse dyes are. For more information on dyes for nylon, see Dyes for Protein Fibers. You'll want to test a swatch before committing yourself to the project, as nylons vary. Spandex can be dyed with metal complex acid dyes, but it is much more common for hand-dyers to dye only the cotton portion of a cotton/spandex blend. Polyester/spandex blends cannot be dyed. See How to dye spandex. 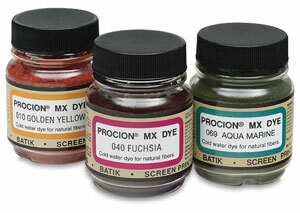 Acrylic fiber can be dyed with disperse dyes or with basic dyes. See About Basic Dye and How to Dye Acrylic Yarn and Fabric..
Ingeo is the trademark for a new synthetic fiber, polylactic acid (PLA), made from corn. It is dyed like polyester, using disperse dyes, though it is evidently somewhat less washfast. Most cotton/polyester blends are best dyed as for cotton, using fiber reactive dyes, leaving the polyester undyed. Cotton/nylon blends may be dyed with all-purpose dye, or by successive dyeing with a fiber reactive dye such as Procion MX, first with soda ash at room temperature to dye the cotton, then in hot water with vinegar to dye the nylon. Pigments that are not naturally attracted to fibers may be mixed with a gluelike binder to attach them to the fiber. "Pigment dyes" are not dyes at all, but a type of fabric paint. See the Fabric Paints page. Which Washfast Acid colors are pure, and not mixtures? Which Procion H dyes are pure unmixed colors, and which mixtures? How do they compare from one retailer to another? Which Lanaset dye colors are pure, rather than mixtures? Which synthetic food dyes in the US are pure, rather than mixtures?